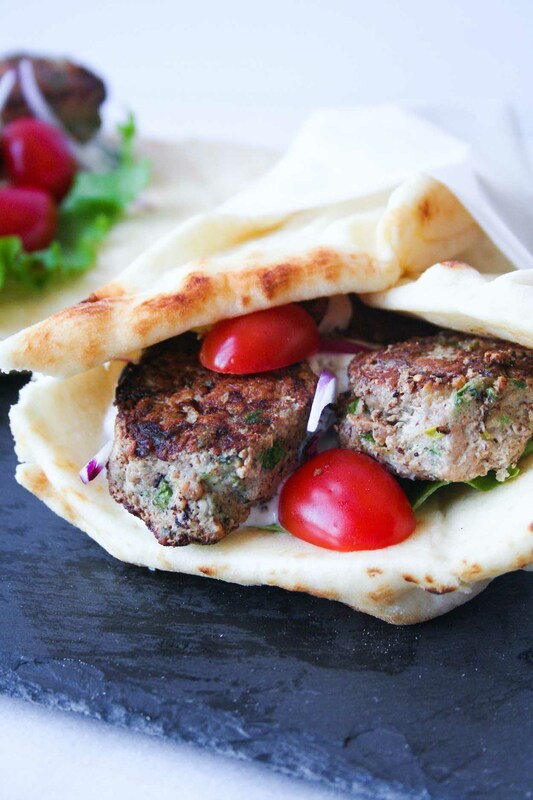 Ottolenghi’s turkey zucchini meatballs blanketed in a piece of warm naan and smothered with simple Greek yogurt tzatziki sauce to make my favorite gyro! I’m listening to my favorite song of the summer. I BOTTLED MY FIRST BATCH OF KOMBUCHA LAST NIGHT. And I’m so. freaking. excited. Yes, this was the bottling after the first brew, so I still have a whole extra week to wait before I can drink the stuff… but I’m giddy with excitement. I made a two gallon batch which turned into a half gallon growler and 11 16 ounce bottles. SO MUCH. I’m also in a great mood because I enjoyed the best dinner, then lunch, and then lunch again this week. I cannot get over Ottolenghi’s turkey zucchini meatballs. You can find the recipe in his book Jerusalem, all over the internet, and a slight adaptation below. Ottolenghi is an Israeli-born chef, restaurant owner, and writer. You can see and taste the Israeli flavors in his dishes, which he somehow marries perfectly with flavors from Asia, the Middle East, and the Mediterranean. He is truly a culinary genius – I have this book too! These meatballs are a recipe I come back to again and again. The ground turkey has such a mild (if any) flavor that it acts as the perfect vessel to carry all of the spices in this dish – mint, cilantro, garlic, cumin, salt, cayenne, and pepper. Normally I would just eat the meatballs as is, but as I was walking through the grocery store, I was craving carbs and before I knew it, there was a package of naan in my cart. Well how did that get there?! I decided not to fight it and roll with it instead. 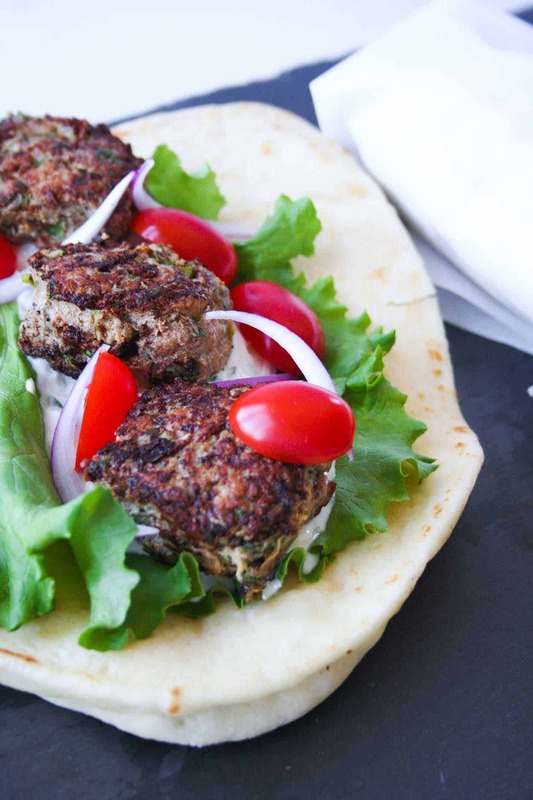 Thank goodness because now I am able to bless you with turkey zucchini meatball gyros with Greek yogurt tzatziki. You’re welcome. Have you tried any of Ottolenghi’s recipes? I’d love to hear your favorites – share yours in the comments below! 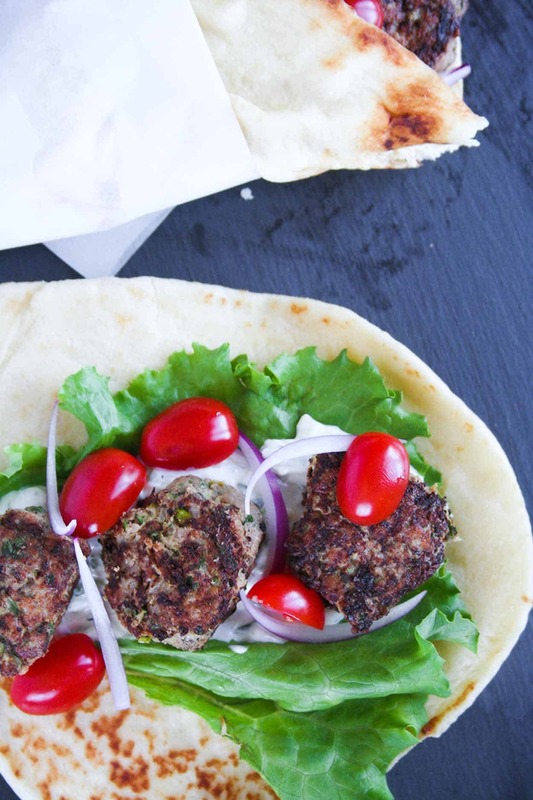 You must make these Turkey Zucchini Meatball Gyros this weekend and don’t forget the tzatziki! If you make this sauce or any of my recipes, don’t forget to post a picture social media and use the hashtag #imhungrybynature for a chance to be featured! Heat 2 tablespoons oil over medium heat in a large skillet. Add the meatballs in small batches, browning each side. Make sure you don’t crowd the pan. Continue until all meatballs are brown, adding extra oil to the pan as needed. Place browned meatballs on parchment lined baking sheet and bake for another 6-7 minutes, until cooked through. 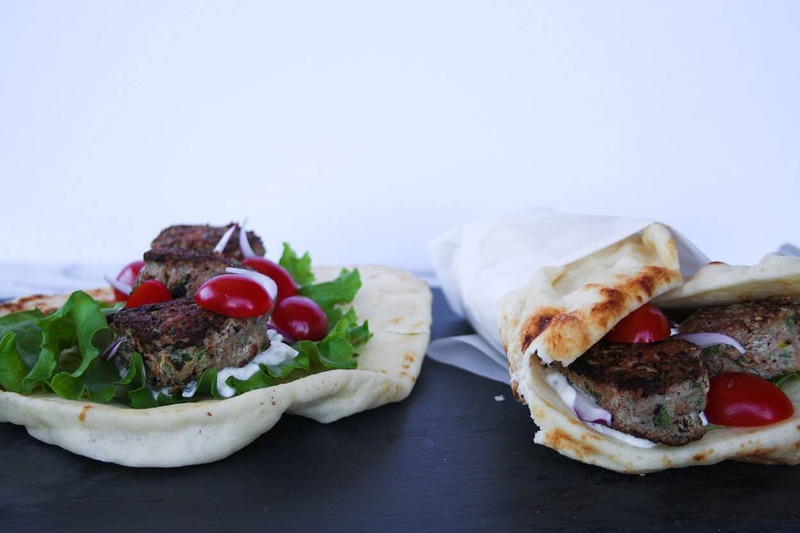 After the meatballs are cooked through, add the naan directly onto the grates in your oven. Heat for 1 minute, until naan is warm and pliable. love this new version of a classic!! I love turkey meatballs so I know i would LOVE this! You most certainly will! I am in love with all of Ottolenghi’s recipes, but this one is my favorite!! Ooh wow, I know what you mean by craving carbs and picking up some yummy carbs to supplement a meal. I love naan; thick flat breads are my absolute favorite. Also? 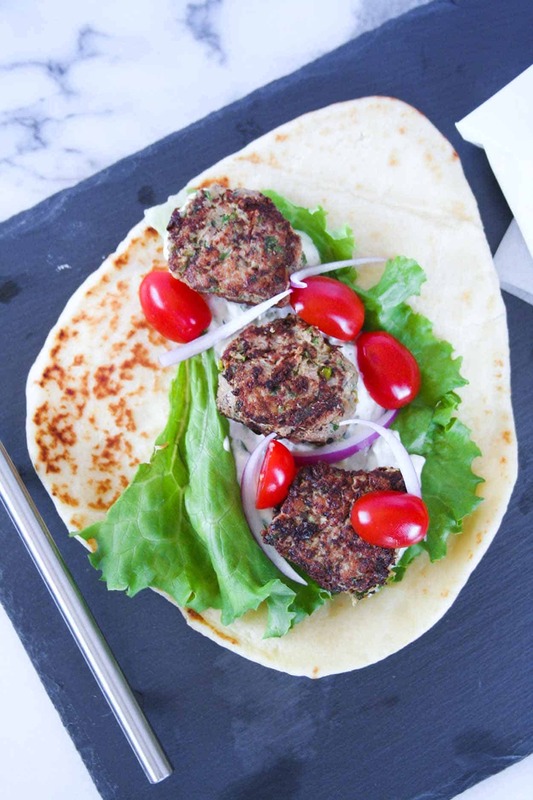 Gyros are so delicious, and that was a genius idea to put meatballs in them! I know what’s for dinner tonight! These look delicious! The best part is I have these ingredients in my fridge right now. I’m admiring the slate? right? background. Thank you Theresa! And that is even better!! Yes, it’s a slate cheeseboard and I believe it’s from Macys!